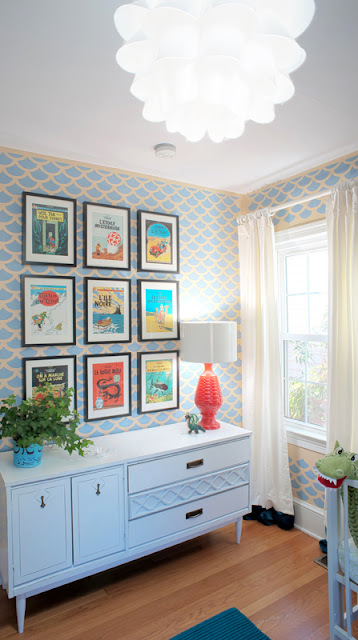 Mix and Chic: Fabulous Space- Tintin Inspired Nursery Design! A few weeks ago, I stumbled upon a beautiful nursery. It was designed by the talented Danielle from Fresh Quince Interiors. The first thing that catches my eyes is the gorgeous scallop wall treatment. Believe it or not, the blue scallop wall is not wallpaper but stenciling done by her loving and wonderful husband! It took him more than 13 hours to complete it, you got to admire his patience. Inspired by the comic book Tintin, vintage French Tintin book cover prints were used as the artwork above the white dresser. Additionally, a decorative banner was made using copies of Tintin pages enlarged from Tintin covers. You may read more about the nursery here. Also, be sure to read about Danielle's helpful stenciling tips before you start a stenciling project for best results. Now, let's take a look at this chic and adorable nursery below. Are you in love with this fabulous nursery? 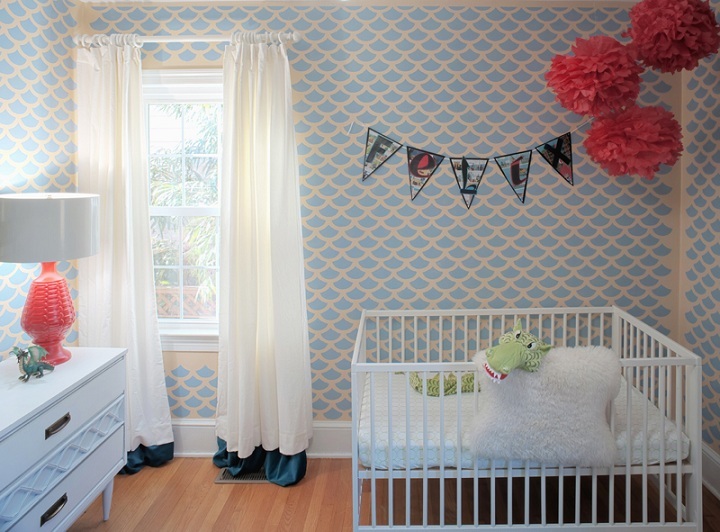 The baby blue and coral color palette looks fresh and stylish in this nursery! I am very much inspired by this room and can imagine the same scallop treatment used in a living room, office or bedroom in a different color. 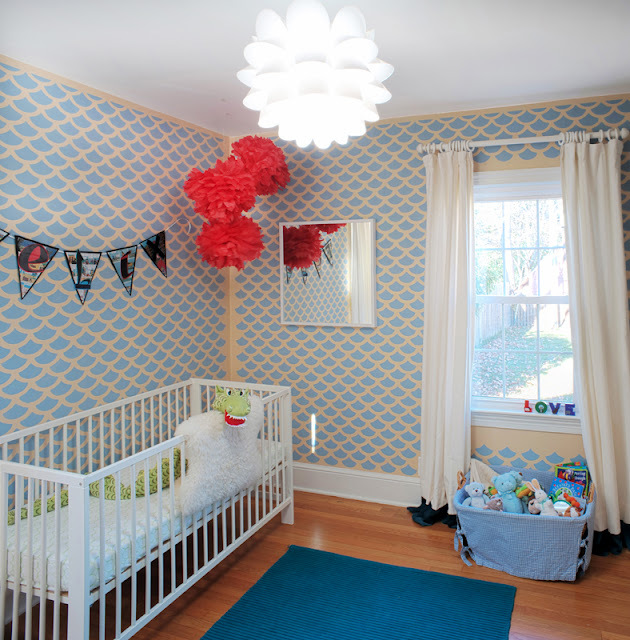 Do you feel inspired by this nursery as well? What are your thoughts? Wow, saving those photos for the future! The wall treatment is just fabulous! Wow what a great husband! Love the walls - playful. Oh it's adorable!! What a sweet nursery! I can't imagine how much patience all that stenciling would have taken but boy was it ever worth it- it looks amazing! So cute! I just bought a stencil to try. Let you know how it comes out. So cute! Since I'm expecting I've been obsessed with nursery ideas so it's great to add another to my ideas list.